Through numerous engagements, Jesuits and scientists are developing constructive dialogue on caring for our environment. This dialogue of values with science recognises the work that science is doing and the need to build bridges with broader society in seeking a more sustainable world. 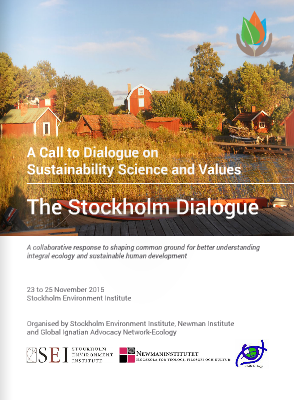 Prior to this “Stockholm Dialogue”, several steps were undertaken with different groups and partners from the scientific, academe, social sciences and religious communities to initiate discussions on transformative research governance that seek to generate diverse responses to integral ecology and sustainable human development. Also, these dialogues seek to develop more critical understanding about transformative research and governance through knowledge and experiences shared by many across the globe. These also hope to generate collaborative engagements among participants on topics that promote sustainability science, education for sustainability and transformative values. During the first week of September 2013, GIAN-Ecology held a core group meeting in Stockholm. The opportunity to meet emerged with the extraordinary support of the Newman Institute in Uppsala. The Institute offers courses in philosophy, theology, and cultural issues, and was recently recognised as an institution of higher education by the Swedish authorities. The support of Andreas Carlgren, former environment minister of Sweden and currently a member of the Institute, has been crucial for the group to meet in Stockholm, and also with Fr. Mikael Schink SJ, facilitated the meeting. The conversations with numerous people turned to the need for greater hope and action, and for this, the importance of clear values in life and an attitude of living a simple life were seen as critical. Institutions of government and much of secular society do not embody a value system and along with this, the youth and young professionals face both work insecurity and a consumerist “ethic” but with little reflection to bring them forward in making the decisions and forming the hope that this generation needs. Even Jesuit institutions of higher education are challenged to accompany students in learning how to make decisions for life. The discussions focused on the need for clear values in society by which we can live a simple lifestyle closer to the land. The stories are multiple and local but as yet are not communicated as desirable in a consumerist society. The challenge that is recognised is how to communicate and network with the values of sharing and caring; of the relational component in achieving basic needs on the one hand, and on the other, living simply in a consumerist economy as it stands. There is a need to focus on a language and a pedagogy that is easily understandable and engages people. Step 2: Conference on Transformative Land and Water Governance: a collaborative engagement towards transformative research and governance for sustainable human development. The conference, which was held from 21 to 23 May 2014, drew 100 participants. It builds on previous conferences co-organised with the Jesuit institutions of Ateneo de Davao University, Ateneo de Cagayan-Xavier University, University of Namur, Gembloux Agro Tech and Environmental Science for Social Change talking through topics related to vulnerability to resilience, migration and soil fertility assessment. There was considerable Jesuit scientific and social presence, with representatives from Environmental Science for Social Change, Manila Observatory, Ateneo de Davao University, Ateneo de Cagayan-Xavier University, Loyola House of Studies, Arrupe International Residence (Philippines); University of Namur (Belgium); St Xavier’s College Kolkata (India); Jesuit Social Services (Australia); Jesuit Province Australia; Jesuit Social Services (Timor Leste); Jesuit Service (Cambodia); Jesuit Refugees Service (Indonesia); Social Apostolate-Jesuit Conference of Asia Pacific; and Jesuit European Social Service (Brussels, Belgium)). The conference was about a re-thinking, a shifting, a changing of attitudes to allow transformative and innovative governance of natural resources development and management, especially in the context of Mindanao with its fragile environment and peace and the diversity of its cultures and people. The gathering is also about a group of people coming together from different parts of the globe to look more deeply at the broader sense of mission and environmental concerns, developing collaborative strategies, and envisioning practical, contemporary responses that reflect a creative care and compassion for an integral, inclusive, sustainable, and quality human development for people and cultures. Pre- and post-conference visits were arranged for people to see a dialogue of science and values. Science has a great deal to contribute to the well-being of society and needs to increasingly link to a broader set of human values that can communicate more effectively the scientific message that Anthropocene is a new era for the world in which we have a hold in its turning. Andreas Carlgren, discussed this further in his keynote speech. A further discussion on sustainability science and values was held in Namur where community of academe, social and physical scientists and religious joined the meeting. Step 4: Sustainability discussion in Loyola University Chicago, March 2015. Sustainability science and values were parts of the discussion during the second annual climate change conference held Loyola University Chicago last March 2015. Step 5: Water security discussion during the Global Earth Summit IV in Kolkata, India. GIAN-Ecology South Asia, the Social Justice and Ecology Secretariat in Rome, and Saint Xavier’s College, Kolkata were the joint organisers of the three-day international conference (March 2015) and drew around 45 Jesuits from all over India, Sri Lanka, and Nepal. Students, professors, and alumni of Saint Xavier’s College-Kolkata also participated in the summit and reflected on the theme of global climate change and water disasters. Field visits to the wetland development in Eastern Kolkata, the Sundarbans-Biosphere reserve, and areas affected by the 2004 tsunami and Cyclone Aila in May 2009 were also undertaken. Step 6: JESAM Ecology Water Week 2015: Access to safe drinking water for all. The Jesuit Africa Social Centers Network (JASCNET) and the Global Ignatian Advocacy Network (GIAN)-Ecology organised the JESAM Water Week from 31 August to 4 September 2015 in Nairobi, Kenya with the theme Access to safe drinking water for all, a work focus of GIAN-Ecology. Participants listened to various experts from UN Habitat, UNEP, National Environmental Management Authority (NEMA), and GIAN-Ecology leaders and shared their experiences from various African countries on the challenges faced by many African countries in providing clean drinking water to the population.